A history of bug fixes and new features found in the version updates for ArtRage 5. These are free incremental updates for improving your purchased software. ArtRage Lite uses the same version number and will usually be updated at the same time as ArtRage 5, as it has the same bugs, compatibility requirements, and improvements. With the exception of features that are only found in ArtRage 5 (e.g. all the initial update for ArtRage 5 will be ArtRage 5 only until all the new features are stable), all of the updates below also apply to ArtRage Lite. You can download the latest version from the Member Area, once you have registered your product. We’ve addressed a problem that could cause errors when pasting content to a layer in a hidden group. We’ve made a change to tilt handling to fix a problem that could occur on some devices using Windows Realtime Stylus input where tilt values would be processed incorrectly. Fixed some issues with Tilt processing on Surface devices and Stylus Profiles not properly updating the selected tool when you bring a stylus to the tablet on compatible devices. We’ve added an ‘Allow Touch’ option for Surface devices running Realtime Stylus that allows you to turn off touch processing on the canvas. Note that this may work on other devices, but we can’t be sure at this time. Stencils now resize properly when you zoom the canvas using the zoom level text edit. We’ve corrected a mistake in the Stencil Options menu in ArtRage Lite and stopped the app forgetting that changes had been made to a canvas if you cancel save during naming the file. We removed a ‘Handled Error’ message that would pop up for no reason when you cancel script recording. Fixed various scripting bugs including cancellation of transform of pasted content not scripting, crashes when bump blend mode was set to replace in scripting, incorrect layer ordering after importing images in scripts, and tool selection problems after ending warp in scripts. Fixed a bug that allowed painting during temporary H/V flip on Windows. This problem resulted in some unintended partial functionality. Added localised strings for Guides and Document menus. Fixed a UI problem with package file description editing when in Lights Out mode. Fixed a problem that would cause ArtRage to believe it had crashed when starting again after a Win10 restart event. Fixed a timing issue that could cause the Crop/Resize Canvas positioning menu to fail to update if opened quickly after moving the target position of the new canvas. Removed the non-functional Warp Brush shortcut from the shortcuts menu. Fixed a problem that could add large numbers of grid and perspective sets to PTG files saved from Lite. Fixed a problem that caused the app to forget a painting needed to be saved after making changes if save was cancelled when opening a new painting but the new painting operation was also cancelled. Removed non or partially functional options from the Stencils menu in Lite. Fixed a crash that could occur in input panels generated by scripts. Fixed a bug that caused the Canvas Mover to lose its ‘Tear Off’ button when docked. Fixed a bug that caused the wrong tool to be selected after application of a scripted warp. Fixed a bug that caused the sampler cursor to get stuck when sampling off media when sampling the current layer only. Fixed an artefact that could appear in non square Custom brush heads. Fixed a bug that caused the Light blend mode in the Emboss Layer Effect to update to match the Shadow blend mode when activated. Fixed artefacts that could occur when updating a large scale Pillow Emboss Layer Effect. Fixed a bug that prevented the Fill tool being used in Scraps. Fixed a script bug that could prevent processing of some manual scripts. Fixed a slowdown that would occur when merging layers in groups or structures with hidden layers. Removed the Rotate entry from the Transform pane when transforming Tracing Images as they can’t rotate. Fixed a potential overflow of colour values in areas of partial opacity that could lead to artefacts. Scripting input panels now respect Lights Out mode properly. Fixed a bug that caused the numeric values for guides to appear under the Menu Bar when changing documents. Adjusted the Aspect Ratio lock option in resize panels to avoid conflicting with selected custom sizes. Made sure the Show Guides button on the Layout Panel updates when adding guides after tearing the panel off. Updated the Layer Effects indicator in Layer previews when cancelling the Layer Effects pane. Re-enabled the F5 shortcut for toggling canvas lighting in ArtRage Lite. Removed the ‘New Sticker Sheet’ option from ArtRage Lite, it didn’t do anything because that feature is not available in the product. ArtRage Lite has been updated from version 4.5.10 to 5.0.4. This is a free update for all existing and future owners, including users who downloaded Lite from Wacom and updates Lite to use the latest code from ArtRage 5 for better performance and operating system compatibility. Adjusted transform operations in scripts to correct problems with transformed content offset on playback. Cancelling layer texture edits no longer produces an erroneous ‘handled’ error popup. Adjusted menu bar layout to reduce instances of overlapped items. Made some changes to PSD text layer import to fix problems after changes to the internal text format of the file type. Adjusted fill to correct some opacity issues and improve speed. Guides are now placed correctly when playing back a script at greater than 100% size. Fixed a bug that prevented Recent Files after the 10th one in the list from working. Adjusted tap and hold right click helpers to allow functionality in the grips of the corner roundels in Classic mode. Adjusted positioning for corner panels so that they remember their last dropped location when torn off a second time. Corrected some English strings in the French localisation. The Rename option for layout sets now defaults to the current name of that set rather than ‘Untitled’. Fixed a bug that caused the script playback controls to indicate ‘stopped’ state when playing back a script that had a painting inlined in to it. Tooltips no longer get in the way of clicks on buttons on floating panels. Fixed a crash that could occur when launching the brush designer from the Tool Settings panel when it was open as a popup from the Menu Bar in Docking mode. Fixed a potential issue at tool up time relating to canvas snap points. The OS X cursor now updates around the edges of references to indicate rotate and scale points. Clicking a reference in the Refs panel now brings its window to the front. Fixed a problem with the sampler working in the lower area of a canvas that is taller than it is wide – The sampler would not process when in those areas. Fixed artefacting and some repeated impression issues in the Custom Brush. Classic mode Tool and Colour picker Collapse buttons now respect Lights Out mode changes. Scripting now correctly records gradient fill operations. Added a wait indicator to Redo operations after undoing Warp. You can now paste text in to a new layer on OS X (apparently this didn’t work right back through ArtRage 4). Updated the Auto Trace indicator for Lights Out mode. If you can interact with the menus and buttons, but can’t make any marks on the paper, or can draw fine but can’t use the menus properly, then the problem is usually the tablet driver settings. If you are using ArtRage for iPad or ArtRage for Android, make sure that you haven’t set it to ignore touch input from your finger or use a different stylus. If you are using Windows, then the issue is usually tablet drivers. Go to Edit > ArtRage Preferences > Input Devices. If both Realtime Stylus and Wintab are ticked, this is almost always the problem (ArtRage tries to autodetect the one you need to use, but if the tablet driver or operating system sends the wrong signal, ArtRage can’t use it and appears to not be responding). If only one is ticked, you might need to change to the other one. If you are using a separate graphics tablet to draw on (or a mouse! ), turn off Realtime Stylus and restart ArtRage. If you are using a touchscreen device (e.g. a Cintiq or Surface Pro), turn off Wintab and restart ArtRage. A history of bug fixes and new features found in the version updates for ArtRage 4.5. These are free incremental updates for improving your purchased software. ArtRage Lite uses the same version number and is updated at the same time as ArtRage 4, as it has the same bugs, compatibility requirements, and improvements. With the exception of features that are only found in ArtRage 4, all of the updates below also apply to ArtRage Lite. Support for AES styluses on Windows that provide stylus ID information. This allows ArtRage to recognise different AES styluses and allocate tools to them via the Stylus Manager in the application. Realtime Stylus: Fixed a potential slowdown that could occur after painting for some time using a Realtime Stylus input device. Scripts: Fixed a crash that could occur when using a manually written script to trigger a file dialog. Transform Shortcuts: Fixed a bug that prevented zoom shortcuts working during transform. Blend Modes: Made some changes to saturation blend mode to match the approach taken by Photoshop. Mac OS X: Fixed a problem that prevented the app properly leaving full screen mode if it had been entered via the + button on the window titlebar. Tool settings that were set to modify using the mouse wheel would reset to 0% when the application was reloaded. Fixed a crash that could occur when using the sticker spray with symmetry turned on. Fixed a bug that prevented ink pen settings working correctly in all symmetry segments other than the one being painted to unless those settings were modified after symmetry was activated. Fixed a bug that prevented reference images and stencils being removed from the Toolbox Panel when they were removed from the canvas. Mac OS X only: Changes to help work around the lag in tablet events that appeared in OS X 10.11. Re-implemented 32 bit support on Mac OS X. Fixed a bug that could cause colour sampling issues if running on multi-monitors with a canvas smaller than the window. Fixed a bug that prevented individual panel scales being saved to preferences. Fixed a bug that prevented the Art Pen toggle being applied when loading Felt Pen presets. Fixed a crash that could occur on Win10 when Multithreading was turned on. Fixed a crash that could occur in the OS X font system when ArtRage launched on OS X. Fixed a crash that could occur when playing back scripts that had Swatch display modes adjusted during recording. Fixed a bug that could prevent brush size being properly read from scripts. The scripts contain the right data so playback of existing scripts should be improved. Fixed a problem that could make the preview area in adjustment dialogues undraggable on devices that have specific combinations of Wacom drivers and Realtime Stylus input. Fixed a bug that prevented canvas presets clearing Paper Patterns if they did not contain one themselves. Fixed a crash that could occur if a document with a damaged reference image entry was loaded and the references panel opened. Updated OS X build settings to restore 32-bit functionality to the application. Windows 2-in-1 Support: ArtRage 4.5.4 includes support for Windows devices that include a ‘2-in-1’ switch. In general these devices are tablet devices with a docking system, or laptop devices with the ability to switch to tablet mode. ArtRage can be set to respond when compatible devices switch between desktop/tablet mode by turning on the 2-in-1 preference in the Advanced section of the Preferences Panel. When a compatible device switches to Tablet mode, ArtRage increases the scale of its user interface slightly to aid touch accessibility. This preference is turned off by default. Important Note: Due to the way 2-in-1 switching is handled by Windows, devices that do not support it (including desktop computers) report to applications that they are always in Tablet mode. Please do not turn this preference on if you are not sure that you are using a 2-in-1 device. Added an Online Printing feature. Fixed a bug that caused Export Image to fail when exporting from a Layer to PNG or PSD on Mac OS X specifically. Fixed a problem in the Windows 64-bit executable version manifest that could cause system log warnings and potentially crashes on some machines with specific user permission settings. Fixed a problem in scripts that could cause extremely light strokes to be too heavy on playback. This change should allow some scripts that have problems with strokes being too dark to play back correctly. Fixed a problem that could cause a script to go in to Stopped state incorrectly during playback. Fixed a problem that could cause script playback errors when smart quotation marks were entered in a script file. Fixed a bug that caused save to fail when running ArtRage on Mac OS X in a language other than English that ArtRage supports natively (FR, DE, NL, ES, JA, RU). Fixed a bug that caused the rotational component of live tilted pencils to adjust based on stroke direction on OS X, causing darker edges of tilted strokes to shift sides based on stroke angle rather than pen angle. Fixed a bug that prevented the app recognising 32 bit Photoshop plugins when in 32 bit mode on Windows. Fixed a bug that prevented package files created on Windows from being installed on Mac OS X. Fixed a bug that caused problems with Colour Adjustment when played back from a script with a non-rectangular selection active. Fixed a bug that prevented right click menus in Scraps and Views processing on OS X in 64 bit mode. Fixed an installer bug that prevented the desktop shortcut being installed on Windows when requested. Fixed an installer bug that assigned incorrect icons to the various ArtRage file types on Windows. 64-Bit Support: ArtRage 4.5 now supports 64 bit operating systems, which means it can use significantly more memory on your 64 bit computer. As a result the application is significantly faster and can work with much larger canvases than it could previously. See below for details. Grids: The Grids button on the ArtRage menu bar lets you turn on canvas grid overlays which can be used as structural guides while you paint. Live Pencil Tilt: The pencil tool now supports Stylus Tilt where available, allowing you to tilt the pencil during strokes to vary the breadth of the ‘lead’ impression on the canvas. Font Picker & Text Adjustments: We’ve added a font picker panel to make font selection easier, and adjusted how text behaves. See below for details. List Item Reorganisation: You can now manually reorder color samples and toolbox panel items by dragging them in their list. Workbench Reorganisation: You can now manually reorder items on the pinboard, and there is a new Color Samples section to the Workbench that prevents samples from interfering with Pinboard space. Multitouch on OS X: We’ve added Scale and Rotate gesture support on OS X if you’re using an input device that provides them. Resource Duplicate / Move: You can now duplicate items in resource collections and move items between collections by right clicking them and selecting the appropriate option. Selection sets are now saved with documents: Active selection sets will now be saved with your document so that they are available on reload. Significantly improved the speed of transform operations on the canvas, beyond the standard speed increase in the 64 bit version. Significantly improved the speed of large Undo and Redo operations, beyond the standard speed increase in the 64 bit version. Fixed a bug that could cause strokes made after the eraser tip of a stylus was used during scripting to be recorded as eraser rather than the correct tool. Stencil removal added to scripting. Clone tool has been added to scripting. Added initial selection set state to scripts that were started with the current canvas included. Fixed artefacts that could occur while dragging transform areas. Prevented the text tool selecting text on a hidden layer when clicking on the canvas to select a text layer. Fixed a bug that caused paint stroke grain interactions to be offset from the position of the visible grain in the canvas. Fixed a bug that caused pencil strokes to project slightly beyond the point at which stroke drag ended. Fixed a bug that prevented Save Toolbox from working if your toolbox only contained color samples. Fixed a bug that prevented the workbench updating if you loaded a toolbox while the workbench was open. Added Shift + K as the default shortcut for the clone tool – Note that you will need to reset your keyboard shortcuts to see this. Moved Global Color Samples to their own file so that resetting preferences no longer resets them as well. Fixed a bug that could cause the wrong preset to be highlighted as ‘active’ when you load a painting file – Only files saved in 4.5 or later will highlight the correct preset, earlier files don’t contain the information required. Disabled file based editing options in the right click menu for Rulers in the Stencil Panel to prevent ‘File Not Found’ errors when those operations were attempted on the virtual ruler. Fixed a bug that could cause symmetry reflected tools to use the wrong settings if switching between some specific presets with the symmetry system active. Adjusted colour sampler drag to hide interface panels as the input point approaches them. Prevented Manual Tracing Image Scale options being available when other tracing scale modes are active. Added About and Preferences items to the standard application menu location on the OS X menu bar. Fixed a bug that could cause some PSD files to import filled with black. Fixed a bug that prevented custom colour pickers being deleted from their resource collection panel. Improved file handling on OS X 10.9 to prevent issues where file names and paths contained / characters. Adjusted sticker sheets so that the sheet vanishes temporarily as you peel a sticker off, allowing for placement beneath it on the canvas. Fixed a bug that made pinboard indicators in the Toolbox incorrectly greyed out when an object was first added to the list. Adjusted the error message displayed when attempting to import a non-image file in to a map slot in the sticker creator to remove the ‘success’ indicator. Fixed a bug that caused multitouch panning on OS X 10.9 to work slowly. Mac OS X: The ArtRage installer installs a single application that works in both 32 and 64 bit modes. By default the application opens in the mode appropriate to the computer you are running on. 64 bit OS users can force the application to run in 32 bit mode by selecting the ArtRage icon in the Applications folder, select Get Info from the Finder’s File Menu and turning on the ’32 bit Mode’ checkbox. Turning that off will revert the application to 64 bit next time it launches. Windows: The ArtRage installer detects the type of operating system you are using and installs the appropriate version. If you are using a 32 bit operating system only the 32 bit version is installed. If you are using a 64 bit operating system the ArtRage.exe that is installed will be 64 bit but we also install ArtRage32.exe, a 32 bit version that you can launch if you need to. Please note that the installation location of ArtRage 4.5 may be in either the Program Files (x86) folder if you had a previous version installed, or the Program Files folder – The installation location makes no difference to whether the 64 bit version will launch correctly. Windows XP Users: Unfortunately ArtRage 4.5 is not compatible with Windows XP. Owners of ArtRage 4 purchased from our store can still download the older 4.0 version from the Member Area whenever you need it but the updated version will not work on your operating system. Owners of ArtRage 4 on Steam can opt in to the Windows XP Branch of the product by locating ArtRage in your Library, right clicking and selection Properties, then in the Beta Tab opting in to the WinXP branch. This will make sure that your version of ArtRage remains at 4.0. If you have an active text selection, that text is updated to the new selected font. If you have a caret active in a text layer but no selection, the new font is used when you start typing. If you have no caret active but you are on a text layer, the entire layer is updated to the new font. If you do not have a text layer active, the font selection remains and that font will be used next time you create a new text object. The new Font Picker allows you to select fonts from a dialog list rather than a menu. It supports navigation keys for scrolling and you can start to type the name of the font you want to skip to that point in the list. Double click a font or select it then click OK to choose the new font. Items in the Color Samples panel, Toolbox panel, Workbench Color Samples area, and Pinboard can now be dragged to reposition them manually. Items in the Color Samples panel can be dragged between the Global and Local sections if you want, or just rearranged inside their own section. Items in the Toolbox panel can only be dragged within their own category. For example, you can’t drag a Preset in to the Stencils category. The Workbench Color Samples area is a resizable area that lists all of the current Toolbox Samples if any exist – You can resize this area as you want and as samples get added they will expand downwards within that area rather than eating in to the Pinboard. Items on the Pinboard when in Workbench mode can be reordered around each other as you wish. Fixed a bug in 4.0.5 that prevented check for updates completing the check. Note: Because the bug in 4.0.5 relates to update checking, the Steam version does not require this update. We’ve made some changes to the way ArtRage handles pressure ranges on Windows systems that use the Realtime Stylus for tablet support and have more than one digitiser device registered with the system. This should address low pressure ranges reported on the new Sony Vaio devices that were experiencing problems with light strokes. It should also allow support for correct pressure input on devices that have multiple digitisers plugged in. Fixed a problem that could cause PSD files written by some applications other than Photoshop importing with bad layer data. Fixed a bug that could cause menus on OS X to become inaccessible after attempting to use Adjust Colors or other layer editing effects on a hidden layer. Fixed a problem that could cause cursor behaviour issues on Windows running with a 150% magnified screen. See technical notes here. Fixed a bug that could prevent Package Files written in ArtRage 3 that contained Chalk presets not to install properly in ArtRage 4. Fixed a memory leak that could occur on uninstalling Package Files. Fixed a crash that could occur in situations where the app was unable to read the contents of the Tool Presets Collection folders. Fixed a bug that would cause the app to become unresponsive on OS X when checking for updates in full screen mode. Fixed a bug that allowed menus on OS X to be accessed while a modal panel was up. Fixed a bug that caused non-compressed PSD files to appear with a black background on import. Fixed a bug that caused files that had a group as their base layer to save without creating a pseudo-canvas layer when exporting to PSD. Fixed a bug that caused DPI and Unit Type changes made while using the Resize panel to be lost on apply. Fixed a problem that could cause script nesting errors in long scripts when rulers had been applied and removed. Fixed a bug that could cause the layout of the toolbox panel to be incorrect if Show Samples With Names was toggled when no toolbox samples had been added and the toolbox panel was open. Fixed a rare crash that could occur on OS X when using a complex selection set in a large document and triggering transform. Fixed a rare crash that could occur when using auto-repeating tools such as the airbrush or wet blenders in scraps and views. Made a change to memory handling that should allow addressing of larger memory space on Windows. Previous builds were not using the full 32 bit address range. Adjusted the layout of the Samples panel to reduce Herman Grid illusion problems. Clicking the entry for a reference in the Reference panel now brings that reference to the top. Exporting a layer will now set the default name of the exported file to the layer’s name if it has one. Added tooltips to the Workbench toolbar for the Tool Picker, Tool Size, Layer Control, and Zoom Level Control. Corrected an incorrect reference to the suffix of ptgback files in the manual. Corrected the palette knife manual entry to indicate that paint can be applied by the knife if loading is over 0%. Fixed a crash that could occur when importing image files in some situations, probably relating to default canvases. Fixed a crash that could occur at the end of a paint stroke on Windows with some driver/hardware combinations. This could also cause modal panels such as the Preferences Panel to become unresponsive. Fixed a bug that caused the ArtRage window to shift downwards on the screen on OS X when starting the app if it wasn’t in full screen mode. Fixed a bug that could cause stencils added to the toolbox to change type after reloading the document they were stored in. Adjusted keyboard handling to speed up response to Wacom touch ring events on OS X – Events were being cached so continuing to process after the touch ring was released. Fixed a bug that could cause corruption on a new layer that was created by duplicating a hidden layer that had metallic paint on it. Fixed a bug that prevented file type selection being properly persisted in export dialogues on OS X. Fixed some minor errors in the Russian translation. Added some missing localised strings in the Japanese translation. Added checkboxes back in to script playback dialogues for scripts that require user input, eg. ‘Merge Layers’ option in the Drop Shadow script. Adjusted the ‘Coarse Canvas’ grain to remove some tiling artifacts. Fixed a problem on OS X that could cause panel positioning and window visibility problems when using ArtRage with two monitors. Fixed a bug that caused presets to be installed in the wrong location by Package Files. Fixed a crash that could occur if adding a group with a / in the name to the sticker collection. Fixed a problem that could cause loss of input operations when right clicking during while touching the canvas during application of a transform operation. ArtRage for iOS is a powerful, intuitive painting package that makes it easy to produce natural looking artwork on your iPad. It is based on ArtRage 3, and includes most of the same traditional tools, and intuitive approach. The interface has been adapted to the iOS platform, and is easy to use with finger or stylus. Paintings from the iOS app can be easily exported to the desktop version, and Scripts can be played back at increasingly large sizes in order to create larger quality files. ArtRage for iOS can be purchased on iTunes here. If you experience a problem with ArtRage let us know using the Support Page. We’re happy to work through problems with you and in most cases we can quickly resolve the issue. Speed issues or crashing can usually be resolved quickly and easily by closing parked apps and rebooting your iPad. In other cases we can use crash logs generated on your iPad to track down the exact cause of a problem and produce a fix. Many of the fixes listed in this update came about thanks to users who had problems telling us about them, so don’t hesitate to get in touch. Version History 24 Jan 2018 Version 2.3.4 We’ve solved some problems that could occur when opening the References Panel or using Reference images, fixed a problem that could make the color picker vanish as you start painting as if you were painting close to it, and re-implemented applying Loading values when using Palette Knife Presets. We’ve also updated to the latest Wacom stylus SDK for updated device and pen support. Updated to the latest Wacom stylus SDK for updated device and pen support. Fixed a crash that could occur when opening the References Panel or using Reference images. Fixed problem that caused the Color Picker to hide when painting anywhere on canvas. Updated For iPhone X: We’ve gone through the app and updated layouts to make sure that everything is in the right place and accessible on iPhone X. Fixed a crash that could occur when importing reference images on iOS10. Fixed a crash that could occur when pasting content copied from a hidden layer. Added ink back to painting titles in the gallery so they’re not white any more! Fixes issues with exported PTG files preventing the previous update from installing on iOS11 and improved drag and drop compatibility. iOS11 Files app support for ArtRage files. Note that the Gallery doesn’t allow drag/drop at this time as it maintains additional data related to files, but the Files app does list any files exported to iTunes/Files from inside ArtRage and can be used to import via the sharing system. Drag / Drop Layer, Reference, and Tracing Image assignment from Files and other image applications that support drag. iOS level PTG file thumbnails and Quicklook support. Updated sharing system on both iOS10 and 11 that allows import from any app that supports file sharing and export to any app or service on the device that can accept appropriate files from ArtRage including iCloud Drive. This fixes a problem that prevented the app interacting with Dropbox, Facebook, and Twitter after recent updates. Added wait indicators for longer import operations. Added a Pressure slider to the ink pen. Adjusted the Tool Settings panel so that it can scroll on smaller devices. Fixed a bug that prevented the precise colour picker from functioning correctly when Tint/Tone mode was active. Fixed a bug that caused the screen to slide up when editing the size of paintings in landscape mode on iPad devices that had a hardware keyboard attached – When the keyboard does not overlap the edit, it not longer slides out of the way. Fixed some minor UI issues in tracing image and pop up options in the settings panel. Adjusted Palette Knife pressure to match desktop behaviour. A fix for the layer opacity slider not updating the layer visually. A fix for tool blend modes causing problems with the Tool Settings Panel. A fix for the color sampler failing to trigger sample in some combinations of screen orientation / canvas size. Sundry fixes for problems running on the iOS11 beta. Fixes for misc issues that came in from devices with reporting turned on. ‘ArtRage for iPad’ is now a universal app for iOS devices running iOS10 and later. The old iPhone app has been discontinued, and existing iPad users can install the app on their iPhones as well for free. Now a universal app for iPad and iPhone. Behind the scenes improvements to the export and import options. Adds 3D Touch pressure sensitivity support for iPhones. Added a calibration slider on the ArtRage Settings page for Apple Pencil users. This slider allows you to adjust how hard you need to press to get full pressure strokes with the Pencil. Increase the value to increase the amount of pressure required. Eliminated some blobs that could occur at the start of strokes made using the Apple Pencil if ‘Tap and Hold Color Sampling’ was turned off. Removed a gap between the starting input point and the start of the visible stroke when ‘Tap and Hold Color Sampling’ was turned on. Fixed a problem that caused square canvases to appear at the wrong orientation in some iPad orientations. Fixed a problem that allowed canvases of too large a size to be loaded on some devices. Fixed a problem that prevented three finger and numeric entry tool resizing being recorded correctly in scripts. This update includes Preset Picker changes to address some problems we’ve seen reported when selecting tool presets. Updated for iPad Pro with larger canvases and tools, added iOS9 Split screen support, and hooked up the Apple Pencil’s Tilt and Pressure features to further enhance the realism of our virtual painting tools. 2.1 also includes a large number of performance and memory enhancements along with fixes and other new general features. Added Pressure and Tilt support for Apple Pencil and enhanced various tools to simulate the angle of the virtual brush head. Increased maximum canvas size on iPad Pro to 4096 x 4096 and added presets for 4k resolution. Increased the maximum size of various tools on iPad Pro for the new canvas sizes. Added support for Split Screen functionality to the app. Added Paint Loading to the Palette Knife tool in Flat and Edge modes. Added the option to rotate the canvas, along with an optional toggle to limit rotation to 15 degree increments. Added the option to have popup panels (Layers, Settings etc.) auto dismiss when you start painting. Added non-uniform scaling to Layer Transform. Use the menu in the Transform view to turn on Stretch then scaling from the edges of the object will scale on that axis only. Scale from the corners when in this mode to scale uniformly. Added the ability to ‘Hide Upper Layers’ in the Transform view. Added a recovery button when the toolbar is hidden. Added a visual selector for Wacom Stylus hand angles. Improved stylus support across the board to remove erroneous gestures, add touch rejection, and support the latest iteration of SDKs including coalesced input point values. Swept through the app hunting memory leaks and killed a number that may have caused crashes. Fixed a number of problems that could cause Undo to stop working when partial strokes were processed. Completely replaced the canvas and gesture handlers to improve reliability and increase functionality. Made some adjustments to the trigger point of background save on leaving the app to help avoid situations where a user closing the app by double tapping home and swiping it up would prevent save. Added an optional warning on restart to prompt if the app was closed before save completed. Added a warning when memory is low. Fixed a bug that caused changes in the color picker to reset Metallic back to 0%. Fixed a rare bug that could cause the toolbar interface to load twice in some launch situations. Fixed a bug that prevented Pastel presets from updating the Wax/Chalk value. Ensured that the toolbar is always displayed when returning to the app from the background. Fixed a bug that prevented import from Photos or the Camera when using ArtRage in languages other than English. Prevented renaming a file in the gallery using the name of an existing file. Improved Pogo stylus handling to make gestures easier. Fixed Ink Pen rotation, which wasn’t working. Made sure files with ‘JPEG’ suffixes can be imported. Made sure the sampler preview rotates correctly for the canvas. Implemented performance and memory tweaks for background saving, preset pickers, and colour picker operation. Fixed Pogo stylus crashes on starting the app in iOS9. Fixed Adonit Jot Touch 4 styluses not creating strokes. Fixed erroneous zoom events that could occur when using an Adonit Pixelpoint stylus. Fixed an issue with gallery folders that used file dividers in their names. Fixed a crash that could occur when selecting a preset. Re-added missing Canvas Lighting toggle in the Layers menu. Fixed an interface crash that could occur in the gallery after finishing a file import on iOS9. Fixed Tool settings sliders not correctly applying changes made using the numeric entry. Glitter Tube: Sprinkles particles of various shapes. Gloop Pen: Creates expanding wet strokes with a variety of properties. Support added for Adobe Creative Cloud, Dropbox, DeviantArt Sta.sh. Upload / Download files using available services. Import and export Layers using available services. Load Tracing Images and Reference Images from available services. Load ArtRage and Image files from Mail, Photos, iTunes File Sharing. iOS support for Facebook and Twitter added. Custom canvas presets can now be created. Custom canvas size presets can now be created. Redesigned and rebuilt for current iOS. Significantly improved the speed of panel responses. Significantly improved the speed of layer transformations. New three finger tool size gesture preview for accuracy. Tap / Drag / Release gestures for tool sizing and color picking added. Color Sample Lens functionality added. Precise color picker added with numeric selection of color values (HLS/RGB). Added quick access to New and Export functionality from the canvas view without needing to go to the Gallery. Preferences shifted i the application. Paintings can now be sorted in to folders with folder management tools available. Gallery layout changed to a grid layout with page view optional. Custom resources can be sorted in to categories in the picker. New Size presets allow easy recovery of favorite canvas sizes. Custom canvas presets can now be stored. Updated all stylus support to current standards. Added support for Adobe Ink. Added support for current Adonit models. Improved support for current Wacom models. Improved support for Pogo Styluses. Improved memory handling and stability. Improved background task processing for long operations such as file sharing. Updated Wacom Intuos Creative Stylus Support for new stylus models including the Bamboo fineline and Intuos Creative Stylus 2. This update should resolve a problem that caused crashing when using the airbrush tool on iOS 7.1. Bluetooth stylus support was preventing the app from launching on iOS4. Some text items in the interface were not visible on iOS7 when using a Retina display. This build resolves a problem with the colour sampler that could cause the interface to become unresponsive after sampling with Tap and Hold sampling was turned off. Update Note: If you are updating to 1.6 from 1.4 or earlier, please shut down ArtRage fully and restart your iPad before using it the first time. This helps to avoid speed problems in first time setup that could cause ArtRage to shut down before fully opening the first time you launch it, and makes sure application preferences are clean for the new version. Enhanced Stylus Support: ArtRage now supports the Wacom Intuos Creative Stylus and TenOne Pogo Connect Stylus in addition to the original model Adonit Jot Touch. Optional Tap and hold color sampling: Due to requests from users we’ve made the tap and hold color sampling system optional. By default this is turned OFF. If you would like tap and hold to trigger the color sampler open the Settings app on your iPad and turn the preference on in the ArtRage section. Airbrush Stroke Issues: We have replicated and fixed a problem that could cause odd brush stroke behavior or harsh edged non-undoable strokes to be generated if changing color or accessing other interface elements rapidly after completing an airbrush stroke. This problem was most visible when the airbrush was in Autoflow mode. Thanks to the users who put in the time to help us track this one down! Changes to Save: We’ve made some changes to the save system to improve save speed. This may also assist in the rare cases we’ve seen reported where a file has failed to save properly. Import Popover Dismissal: We’ve fixed a problem that could cause the Import from Photos or Camera popup to remain visible in the Gallery when accessing other menu items without completing the import operation. Landscape Mode Drag: We have made some changes to stroke handling to fix a problem that could cause interface panels such as the tool picker and color picker not to get out of the way when you paint close to them. Color Sampler Hiding: Fixed a rare situation that could result in the color sampler being hidden during a sample operation if you dragged quickly enough up and over it. Added touch and hold color sampler access. Tap and hold still on the canvas to trigger color sampling. Once the color sampler curve appears above your finger you can drag around to sample color from the canvas. Release the drag and the tool you had previously selected is restored. Adjusted panel behavior to prevent rogue paint dabs: To close a panel such as settings or samples just tap on the canvas. No paint event is processed until you do a second tap and drag. Fixed a problem that could cause landscape paintings not to fit screen dimensions by default when created. Adjusted gesture handling during stroke completion to prevent rogue gestures and paint strokes being generated if entered while a previous stroke is being processed. Fixed a problem that caused script export not to be available in the Export menu when running in Korean. Fixed a problem that could cause the canvas preview to be incorrectly positioned when first opening the New Painting dialog. 1.5.1: Fixed a problem that prevented presets being visible for users who updated from a previous version of ArtRage. 1.5.1: Fixed a problem that prevent Layer Blend Mode and Edit buttons being visible on the relevant panels for non-Retina iPad users. iOS 3 Note: ArtRage for iPad 1.4 works on iOS 4 or later. Due to a problem uploading the original 1.3.2 update, some iOS3 users may have been able to download it and found that it did not work. We are currently testing potential fixes that will allow us to do a final update for iOS3 to resolve it, after which time we will unfortunately be dropping iOS3 support. Added full resolution interface for Retina iPad users, everything should be crisp and clear now. Fixed a problem that caused text entry boxes to have black text against a dark background when entering percentage values for sliders. Fixed a problem that could prevent cancellation of an attempt to link to a dropbox account when uploading to Dropbox. Adjusted help system buttons to allow dynamic sizing to fit contents when localized strings were too long to fit their original length. Prevented downloads on iOS3 while we work on a final iOS3 compatible build. Adds French, German, Japanese, and Korean localisations to the product. Fixes a bug that prevented Layer Opacity changes from being recorded by scripts. Upload to Facebook: Upload your images directly to your Facebook Photo Album. Upload to Dropbox: Upload painting files to your Dropbox account. New Export Options: Export PNG or JPG to the iTunes shared file space, PNG, JPG or native PTG via Email. Gallery Interface: Simplified the Gallery Interface to collect all export functions in to a single menu and clarify general operation. Canvas Settings Interface: Adjusted the Canvas Settings interface to make it clearer. Increased the hit area of the Sampler toggle to make it easier to tap. Menus should no longer resize when entering a sub menu, unless they need to expand. Removed script recording for orientation changes and UI show/hide to improve the appearance of playback of scripts on desktop machines. Fixed a potential crash when importing multiple paintings to the Photos app in quick succession. Added layer transparency changes and three finger swipe undo operations to scripted recording. Improved feedback for large export operations so that you know when you’re about to upload huge files online or send by email. Fixed a bug that could cause panels to lock partially transparent but inactive if you select an option from them quickly while they are fading (eg. select a preset then quickly select a second preset before the panel has finished vanishing). ArtRage Script Recorder. With 1.2 you can record your paintings and play them back at higher resolution on a desktop machine using the Script Recorder. You can turn the Recorder on when creating a new file, and every stroke you paint will be recorded to a script file. Script files can be exported via iTunes or sent directly by email to play back in a desktop version of ArtRage. So why is playing back a script at higher resolution better than scaling up the whole painting? When you scale up a finished image the quality will generally be reduced because the app that’s scaling it doesn’t know what detail goes in between the pixels that make up the original. When you play back a script however, the entire painting is recreated stroke by stroke at a larger size, so the individual paint strokes retain their original quality. It’s as if you were painting it again from scratch, having chosen a larger tool and canvas. ArtRage Script Files exported from ArtRage for iPad are compatible with ArtRage Studio and Studio Pro. PNG Export: As well as emailing and saving copies of your paintings to the Photos app you can now export PNG copies direct to the shared file space in iTunes. Updated the Help section on ‘Files’ to cover scripts and improve explanations of how to handle files in ArtRage. Added troubleshooting tips to the Help section for users who experience speed problems: Many speed problems can be solved very simply by following a couple of easy steps. See the Speed & Memory section in the help files! Adjusted Import Image to Layer to scale to fit the current canvas on import. Fixed a problem importing images larger than 1440 x 1440 to layers and references. All forms of image import should now correctly handle images of any available size. iOS 3.2 users can now use reference images, tracing images, and imported photos again. Imported photos on iPad 2 should no longer crop themselves incorrectly in the new canvas. iPad 1 & 2: The ArtRage Painting File format (PTG) has been registered to allow you to load paintings in to ArtRage from other applications on your iPad that support file opening (Mail, for example). iPad 2: Camera support has been added to Importing Images, Importing to Layer, load Reference Images, and Tracing Images. iPad 2: Maximum image size has been increased to 2048 x 2048. Adjusted the Back to Gallery button menu options. You can now save and save a duplicate directly from that menu, or return to the Gallery (which will prompt you if you need to save changes). Changed how the painting orientation system works, to ensure that the painting is upright if its aspect matches your device orientation, and at a reasonable angle if it doesn’t. Added a color sample under the finger when selecting colors in the color picker so you can see the resulting color more easily. Turned of Smoothing on the Inking Pen and Precise Pencil by default to prevent pauses when calculating strokes. Fixed a bug that caused the Wet mode Palette Knife blender to be slower on iPad 2. Fixed a problem that could have caused a crash during save in some situations. Paintings should no longer flip upside down when resetting scale/position with a two finger tap. Fixed a problem that could cause paintings imported from the desktop version to require a tool selected before they could be painted on. Fixed a problem that could cause folders imported to the gallery to display as invalid paintings. Fixed a problem that could cause issues zooming to the corners in landscape oriented paintings. Fixed a bug that could cause grey to be introduced in to blended results when using the wet blender near the edges of a stroke against a transparent background. Significantly enhanced the speed of canvas zoom and pan. Memory Warning: ArtRage uses a lot of memory to track properties of your paint such as its texture on the canvas, how wet it is, and other properties of physical media. This means it can sometimes be easy to run low on memory. A warning prompt now pops up on the ArtRage toolbar when your iPad detects memory is low, and the Help guide built in to the app gives you some steps you can take to help in these situations. Users who have experienced crashes are probably seeing the app shut down by the OS when memory runs out, this warning will help you spot when there might be a problem, and save your work if you want to restart. ‘Show Toolbar’ toggle button that appears when the toolbar is hidden. Some users reported that they lost their toolbar, this is probably due to accidentally tapping with three fingers (the toolbar show/hide shortcut). The new toggle makes sure that if you have hidden the toolbar you know how to get it back. Save Prompt (turned on/off via your iPad’s Settings app) – If on, a quick Save button pops up on the toolbar every 10 minutes if the painting contains unsaved changes, so that you can quickly save your work. Improved painting orientation detection to avoid the painting appearing in the wrong orientation when opened. Fixed a problem that prevented Flip Horizontal working correctly in layer transformations. Improved painting placement in the gallery to reduce instances of paintings appearing in the wrong position. Fixed a problem that prevented ArtRage saving color samples when closed from the multitasking bar. Support for printing from iOS4.2. Support for iOS4.2 Multitasking: ArtRage will now park itself in the background when switched away from, and return when re-launched. The splash screen may appear briefly while the interface reconstructs. Quick access color sampling via a tool toggle. User definable canvas sizing when creating new files (1440 x 1440 max). Zoom level indicating during zooming. Feedback improvements on a number of user interface items including current active preset highlights. Significant enhancements to the stability of the product and memory handling. Improvements to Multitouch gesture handling after Save & Continue, fixing a problem that prevented gestures happening in certain areas of the screen. Corrected a problem that could cause crashes when using the Tint/Tone picker. Fixed a problem that could cause the name of a painting to change after editing canvas settings. The 1.0.1 update improves the stability of the product for users who were experiencing crashes, particularly around the gallery and canvas panes. Corrects a blending problem with the oil brush at 0% loading, and adds the ability to save your work without leaving the canvas. How can I rescue a PTG painting that won’t open in ArtRage? If you receive an error message and are unable to open a PTG file, then it probably means that your ArtRage painting was were corrupted at some point. Damaged PTG files usually result from interrupted saves (for example, if the computer shuts down or ArtRage crashes). We will do our best to help troubleshoot the source of ArtRage errors, but usually cannot fix corrupted or partial files. However, if you can see the image thumbnail then that means that the PNG preview image is intact. If you use File > Import Image File to open the damaged files, then it will import the PNG thumbnail. This PNG file is the full size of your painting and high quality. It won’t rescue your layers or other paint information, but it will give you something to work with. If crashes happen frequently for any reason, or you are working on an important painting, we recommend turning on the Store Backup Files option. You can find it by going to Edit > ArtRage Preferences > Advanced > Store Backup Files. Adjust the slider to the number of backups you would like to keep. Important: This function does not save a duplicate file. Instead, it keeps a history of previous saved versions. Every time you save, it will delete the oldest backup file, and save the latest changes as a separate file, so if you have made important changes, save twice to update the older back up and the file you are actually working on. We have seen a few instances of a crash when attempting to save a file for the first time on OS X when the save file dialog tries to open, and may occur in other situations where a file dialog is trying to open. In many cases this crash appears to be caused by a bad file in the system. This file is called ‘SCFinderPlugin’ and is located in the Library folder. The crash is actually happening outside ArtRage in an OS system so we don’t know exactly why that file is causing it but it has been known to cause crashes in multiple different applications. Note: This is optional, you can skip straight to the solution if you like. When the application crashes, select the Report button. A window with a crash log appears. Near the top of the crash log text, look for a line that starts with: ‘Crashed Thread:’. This line tells you which system thread crashed (a number) but also indicates the function the crash occurred in. You can ignore the number. Removing the file should resolve the crash. You need to locate it and move it out of the library. It may be installed in more than one library location so follow the steps below to locate and remove it. In the Finder, open the Go menu. If you see a ‘Library’ entry, click it. If you don’t see a Library entry, hold down Option on your keyboard and it should appear, then click it. In the Library folder, open the ‘Contextual Menu Items’ folder. If you see it, drag the SCFinderPlugin.plugin file out of that folder to your desktop. Now open the Macintosh HD, the place you see your Applications folder. There should be a ‘Library’ folder in there too. Open that. Repeat step 2 and 3 (you may want to put folders on the desktop to contain the duplicate files). Reboot and try the operation that crashed again. You should be able to delete the files at this point. As noted above, the file and the crash it causes aren’t part of ArtRage so we don’t know exactly why this is happening, but you may find other applications also becoming more stable after its removal. If you still have problems: Please send an email to [email protected] letting us know, and include a copy of the Crash Log generated when the application crashed. To include that, click the Report button when the crash occurs, copy the crash log text from the crash log window and paste that text in to the email you send us. We will need the crash log before we can help resolve the problem. ArtRage Studio and Studio Pro are the two versions of ArtRage 3. We no longer sell either edition, but they are still available as bundled software from third parties. We brought out an important update in 2013 to make ArtRage Studio & Studio Pro compatible with Mavericks. If you purchased ArtRage as bundled software on CD or pre-installed, then you may not have this update. You can download the latest update directly from our Member Area, or, if you purchased ArtRage on Steam, the updates will be downloaded automatically. Fixed a bug that prevented canvas and window updates during painting on OS X 10.9 Mavericks. Fixed a bug that prevented Check for Updates working on OS X Mavericks. Check for Updates now works via our website rather than internal to the application. Fixes a problem that appeared in 3.5.8 that could cause the application to check for updates whenever launched and not remember when the update check flag had been turned off. This update is for versions of Studio and Studio Pro purchased directly from us or received with a hardware bundle, applications downloaded via Steam do not require this fix. A reworking of tablet support to allow systems that have multiple registered tablet devices such as the new Sony Vaio to correctly report the pressure range for their input systems. For Mac OS X 10.8: Added developer certification support to allow the app to run when Gatekeeper is active. For more information, see this thread. Added translations for Spanish and Japanese. Problems relating to the Color Adjustment and Blur panels have been resolved. Using the panels should no longer cause problems when applying subsequent paint strokes. We resolved a problem with script playback that could cause stencils that were scaling and moving during the script to fail to do either if the script was played back more than once in a given session. We’ve adjusted the Multitouch system to prevent instances of single touch paint strokes turning in to multitouch gestures during the stroke. This is primarily useful for users of optical multitouch devices where other things touching the screen (or a brush head splitting and being detected as two touches) could cause problems during painting. Corrected a problem that could cause double strokes when the ink pen applied smoothing after the eraser had been used by inverting a tablet stylus. Adjusted script import so that double clicking a script to launch ArtRage cannot cause problems with other model prompts such as update checks. Fixed a problem that prevented layers with imported images scaling properly in scripts imported from the iPad. Fixed a possible crash that could occur if scripts were played back below 50% of their original size. Fixed a problem related to panel positions and contents on OS X. The problem could cause panels to hide themselves during painting without the cursor entering their precise area. Also fixed a problem that could prevent the window redrawing on OS X after switching to Full Screen mode from the menu bar. Fixed a problem that could cause the app to pause for a long time before prompting for image import when an image was dragged on to the app window. Double clicking script files on Windows should now open them in ArtRage. Fixed a problem in the OS X thumbnail viewer that was preventing it generating thumbnails for some files. Fixed a bug that could cause white layers to darken on merge when the Tint layer blend mode was active. Dropping an ARScript file on to the ArtRage window should now trigger script loading. Corrected the Script File icon on OS X. Fixed a problem with ‘Wait (rVariable)’ in manual script files. Fixed a problem that prevented the sampler tool being manually scripted in stroke events. Added SampleColour(x, y) to the script language to allow manual sampling of colour at a point. Fixed a problem that could prevent script playback scaling the paper texture correctly when playing back a script at a different resolution. Fixed a crash that could occur when open the Grain Picker and closing it without selecting a grain. Fixed a crash that could occur on app startup for OS X 10.4 users. Fixed a bug that could cause some panels on OS X 10.7 to appear in the wrong location when opening, or be too small or devoid of contents. This fix also ensures panels will only vanish during painting if you paint in to their region. Multithreading: Supports multicore processors, spawning multiple threads while it works to speed up tools and many other processes in the application. Scripting: Allows users to record the process of painting for playback on other machines. Play back scripts at standard or accelerated speed to see the painting constructed live. Play back scripts at different resolutions, recreating your artwork at other sizes. (Studio Pro) Record whole or partial paintings in a Script File that can be shared with other users. (Studio Pro) Annotate scripts as you record with Note Bubbles and Spotlights that draw the viewer’s attention to areas of the canvas during playback. (Studio Pro) Scripts are saved with the painting as you work, allowing you to come back to a session and continue recording later. Supports a full, function based scripting language that provides support for variable manipulation and user interaction. Script authors can create branching process scripts that can automate and control most of the functionality of the application. Package Files: Gather together sets of custom content such as stickers, presets, stencils and more in to a single, easy to use file that can be shared with other users. Package Files can be installed with a double click. ArtRage extracts and installs the contents automatically to the user content folders. Installed Packages save a receipt which allows easy uninstallation or repair at a later date. (Studio Pro) Create Package Files with author notes and a preview image to personalize it before distribution. (Studio Pro) Save out partially completed Package Files to a Template so that you can work on them over multiple sessions. (Studio Pro) Real Color Blending: A rewritten Real Color Blending system provides better real-world color results, and improves speed. Content Management: ArtRage now includes easier management of custom content from within the application. Right click custom content items such as Stickers, Stencils, and Presets to rename or Delete them from within the application. Palette Knife Loading: The Blade and Edge Palette Knives can now be loaded with paint before use, allowing you to create smooth flat strokes of paint on the canvas. (Studio Pro) Loaded Palette Knives have additional control over angle during painting. Soft Media Adjustment: Chalks, Crayons, and Pencils have been softened to improve their interaction with the canvas texture. (Studio Pro) Aibrush Controls: Controls for stroke hardness and spatter have been added to the airbrush. Precise Color Picker: The Precise Color Picker can now be left open while you work. Invert Selection: An Invert Selection button has been added to the Selection Settings panel. Interface Adjustments: The interface has been given a clean up to compact some shadows and improve control consistency. PTG Preview Transparency: Added support for transparency masks in the flattened preview in PTG files. This allows ArtRage to import a PTG with Transparency to a layer, and other applications that read PTG to see the painting without its canvas background if the canvas has been made transparent. The Preset Pane now remembers which Preset Group you were in between sessions. The Canvas Positioner can now be toggled using its button on the menu and its keyboard shortcut, rather than just being shown. Large aspect canvases can now have their target position set when you resize the canvas. Added a right click menu to the top and bottom blocks of Group entries in the Layer Panel. Realtime Stylus Support: Tablet support for Windows has been rewritten to support Realtime Stylus, which covers a larger range of stylus and touch based input devices. Added a French Manual to the application. Adjusted Zoom Level handling after Resizing the Canvas to ensure that the resulting canvas fits properly in the window after the resize operation. Improved right click handling on the canvas to make it easier to hide the UI without moving the canvas. Improved user feedback when attempting to delete a preset file that no longer exists on disk. Improved user feedback when attempting to import a non-image file as a Reference Image. Adding a new group in the New Preset Panel, where a group of that name already exists, now selects that Group in the Group List rather than not doing anything. Improved Palette Knife blending to prevent paint going darker when using the Knife to blend at the edge of a painted area over transparency. Corrected a problem that could cause the app to slow down after hiding or showing a layer. Addressed a number of situations that could cause square artifacts in a Watercolor stroke after using a dry brush, or in some blending situations where strokes interact. Fixed artifacts that could occur in Ink Pen strokes when painting while zoomed in. Corrected a problem that could cause Text Selections not to update visually while editing text. Fixed artifacts that could occur in some cases painting over partially transparent Stencils. Fixed a number of situations that could cause the app to become unresponsive in some cases on OS X when double clicking buttons or the grain preview in the Canvas Panel, or right clicking on sliders. Corrected some issues with layer merging that could cause paint to dry, and paint texture to be removed or damaged. Fixed artifacts that could occur when Groups that used the Pass Through blend mode were merged to a single layer. Torn off Tool and Color Panels are now visible after restarting the app. Sticker sheet panels have been resized vertically to ensure their contents are fully visible. Corrected a problem that could occur when opening a sticker sheet below a certain size. The Color Sample Name Edit is not longer offset when the Color Samples panel is scaled to a size other than 100%. Removed Scaling support from Tooltips to ensure they always display at legible sizes. The brush head proxy for the Wet Blender is now visible when scaling using Shift-Drag on the canvas. Stickers that have been flipped will no longer un-flip when their tint is adjusted. Sticker Opacity can now be correctly set from the Sticker Menu button in the Layer Panel. Corner roundels no longer appear in the wrong position after changing global UI scale with UI hidden. Corrected a number of minor translation errors in the non English versions. The Presets Panel no longer resets to the default Preset Group when you changed tool settings while the panel was closed. Fixed a crash that could occur when setting the Filters system to scan the Library folder on OS X. The Refs Pod now updates the number of loaded References when the list is cleared. Tablet Preference changes now prompt for restart if made via a keyboard shortcut. The default name for new groups added to Resource Collections is not longer ‘Add Group’. The number of presets listed in the presets pod now updates correctly after removing a preset. The Transform Rig now reappears after moving the transformed area using the arrow keys on the keyboard. Removed ‘All Files’ type options from Windows Save dialogs. Please Note: Due to some of the new feature requirements we have had to drop support for OS X 10.3 and PPC Macs. The OS X version of 3.5 runs on 10.4 or later Intel macs only. Cursor Opacity: At the request of a number of screencasting or video painting users, the Precise Cursor now has an Opacity slider so you can make it completely invisible. OS Arrow cursors etc. will still be visible. Sticker Shadows: Sticker sheets now have a Shadow toggle that can be used to turn off the shadow on stickers you place individually by peeling from the sheet. When sticker sheets are created they can have the Shadow toggle set OFF, when the sheet is opened for use the toggle reflects the original sheet’s preference. Wintab Toggle: Added a ‘Use Wintab’ toggle to the Input Preferences panel on Windows. 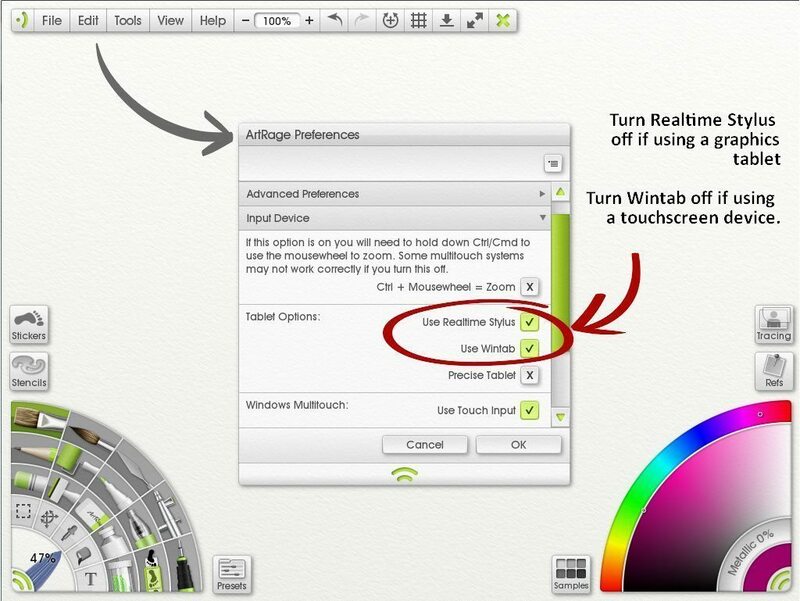 Users who have problems due to the interaction of Wintab and Ink Services can now tell ArtRage to ignore Wintab in cases where it causes an issue. Previously, users could only ignore Ink Services. Ink Pen Tapering: Added Tapering to the Inking Pen. The tapering option allows you to automatically replace the pressure curve of the ink pen with a smooth tapered result when auto-correction happens at the end of the stroke. This feature comes to you courtesy of the ArtRage for iPad development process. Clear: The Edit Menu now has a ‘Clear’ option that is active when there is a selection set, it clears the contents of the selection. Feel free to assign Delete to it in the shortcuts panel, or reset your shortcuts to default and it will be auto-assigned. Presets: ArtRage tracks the current selected preset and no longer deactivates its highlight when you change brush size. This means that the preset you selected will remain lit up until you make a change to the general settings of the tool. OS X QuickView: After installing the new version application and opening it once, PTG files will be previewable using the Quick View option in OS X. Fixed a colour blending bug that could introduce blue in to greyscale blending with the oil and other tools. Fixed a bug that prevented layers properly saving their Use Canvas Texture flag. Ensured that if a preset has been selected for a tool, when opening the presets panel for that tool it will be visible in the list. Fixed a bug that prevented resource panel tile highlights going brighter to display the text over them if the UI tint was too low in luminance. Fixed a bug that caused ArtRage to prevent OS X shutdown if it was open and no changes had been made to the painting. Fixed a bug that prevented the ‘type’ of certain tools being highlighted in the settings panel when the UI tint was grey (eg. type of selection shape and construction mode). Corrected a problem in the manual’s description of the Transform tool. Fixed a bug that could cause layer group duplication or incorrect layer stack placement after undoing then redoing adding a layer group. Fixed a crash that would occur when launching ArtRage by double clicking a PTG file that had the Polygonal Selection tool selected when saved. Fixed a crash that could occur when deleting a custom picker from disk when it was visible in the picker collection, then clicking it in the collection again. Fixed a bug that caused problems with the Width/Height values in the Crop/Resize panel when adjusting the Percentage size of an image in Print Mode. Fixed a bug that caused the Color Picker to lose Saturation value after closing and reopening when 0 luminance colours were selected. Fixed a bug that caused ArtRage to fail to save its preferences on OSX if the app closed due to an OS reboot rather than the user manually quitting. Fixed a bug that prevented Dutch being selected automatically when automatic language selection is on and Dutch is the OS language. Re-release including an Italian translation and manual. Windows users who upgrade from a previous version may need to re-enter their Serial Number the first time they run 3.0.7. Your Serial Number will be displayed on the download page before you can download the new version, please copy it so that it can be easily entered when you launch the new version (if you copy it to your clipboard it should appear automatically in the product when it starts). This is due to a change in the security manifest included in the software. ArtRage now remembers the image format you used to export images of various kinds. Wherever the application allows you to select an image format for export, it will now remember the last format used for that operation. You can now drop image files of any type on to the ArtRage application icon to open the application and prompt with standard import options. The units displayed on the second edge of a ruler can now be changed via right click on the ruler. You can now drag a ruler off the stencils panel the same way you can drag standard stencils. Windows file association has been adjusted in the installer to allow you to move around installed files and not have the installer attempt to ‘repair’ ArtRage when you double click a PTG. Windows users should now be able to shift around shortcuts and rename or remove stencils that were installed with the product. The Windows installer now prompts for a folder name for the start menu shortcut if selected. Resetting the rotation of a reference image correctly resets its preview in the reference panel now. The water glass pod will no longer be visible on starting the app if the tool does not call for it to be visible. The presets panel now updates to display the group a new preset was added to, even if that group was created in the Add Preset panel. Mousing over a reference image now brings up the zoom/pan controls for only that reference image. Shift + Tab cycles backwards through stickers that have transformation focus. Save will no longer overwrite the arrestart.ptg if it was loaded automatically on startup. Saving a recovered painting will always prompt for file name. Fixed a crash related to font lists that could occur on OSX when starting the application. Adjusted the ArtRage manifest file to fix Side by Side errors encountered on Windows both on installation and in the event log. Fixed a bug that caused problems redoing after undoing the addition of an unfixed sticker. This could lead to redo stack corruption. The default canvas type is now applied to the canvas when you Import an image. Fixed a problem that could cause the Auto tag to appear on the colour picker pod when no tracing image was loaded. The default canvas is no longer made transparent after importing an image. Fixed a crash that could occur in very rare situations where there was a hole in a layer of a specific size that could cause a compression problem. The original upload of 3.0.6 had a small problem that prevented correct operation for French, German, and Dutch users. We have uploaded a new version that will work correctly for all users. If you are using ArtRage Studio or Studio Pro in any language other than English and have already downloaded 3.0.6, please download it again. Windows users will need to uninstall the previous installation of 3.0.6 before installing the new one. OS X users can just install the new one over the old one. Pod Hiding: Unwanted pods can now be hidden using the Pods menu in the View Menu. Tool, Menu and Colour pods can’t be hidden but all others can. Photoshop Brush Head Import: Using the menu on the Presets Panel when the Sticker Spray is selected you can now import brushes from most Photoshop ‘.abr’ files. When you select the Import Photoshop Brush option you are given the option of selecting an ‘.abr’ file to import from. When you have selected the file you are presented with a list of available brushes. Select brush heads from the list (Shift-click to multiselect blocks, Ctrl/Cmd click to select single additional items, Ctrl/Cmd-A to select all, Ctrl/Cmd-D to deselect all). When you click OK, a preset is generated for each brush head in the current category of sticker spray presets. You can the edit the variants as you need to create the desired effect. Please note: Some abr files use procedural brush heads that we are currently unable to read. Non-Paintable Warning: When you attempt to use a tool on a layer that cannot support (eg. knife tool on a text layer) a warning icon appears. JPEG Export Quality: The export quality used by the app for JPEGs can now be set in the Export settings of the Preferences panel. Future implementations should allow it to be set on each export but this is a reasonable first step. Right Clicking Pods: Right clicking a pod now triggers the same event as Click and Hold, which allows people who have Click and Hold -> Right Click helpers to use the pods properly. Photoshop Filter Support: Thanks to assistance from users having problems with specific filter sets, and support from the authors of those filters, we have improved general support for Photoshop Filters and the application should now work with a wider range. Corner roundels now position themselves correctly when they reappear if they are hidden by Clear Canvas when the window resizes. Removed the ‘Register’ option from the Help Menu in the Studio Pro demo. Fixed a bug that could prevent layer stack updates when the transform tool was used to select a layer. Fixed a bug that caused spaces to appear after accented characters in a text layer after the file had been saved and reloaded. Prevented the palette knife tool generating a new layer when used on a text layer. Fixed a bug that caused file extensions to capitalise on OSX during export. Fixed a bug that caused the Ink Services toggle to always appear ON when accessing the settings panel, even if it was actually turned off. Fixed a bug that prevented Page Up and Page Down from persisting in keyboard shortcuts. Fixed a bug that caused Okaying the Preferences Panel to prompt for restart even when nothing had been changed. Fixed a bug that could cause odd behaviours when double clicking using a stylus double click rocker button on OSX. The previous system could make it look as if the application had locked up due to multiple dialogs attempting to open. Fixed a bug that could crash ArtRage when duplicating a group that contained text layers. Fixed the HLS variants of the Hair Brush sticker spray preset. Fixed a bug that prevented the canvas updating when importing an image while the text tool is selected. Fixed a crash that could occur on closing the sticker sheet creator with 0 selected for columns and rows. Removed *. * file type from Save As dialogues. As part of this, fixed a crash that could occur when saving a file as *. * in the Save dialog. Fixed a crash that could occur when opening the Edit Menu when filters that had certain characters in their name (< and > for example) had been added to the list of filters to scan. Fixed a bug that could cause ArtRage to crash when running certain filters twice. Fixed an update bug that caused the Presets, Settings and Tool Picker panels to display the wrong settings if the current tool was changed via a shortcut key while in Clear Canvas mode. Fixed a bug that prevented NikSoftware Viviza Photoshop Plugins working (many thanks to NikSoftware for their fantastic feedback and assistance!). The fixes we applied should also work for a range of other filters. Fixed a crash that could occur when undoing and redoing the hiding of a group in the layer stack. Improved support for Wacom Bamboo Touch gesture operations on OS X and are working with Wacom to ensure that their next driver update contains additional information that will improve gesture processing on both platforms. Fixed a problem that could sometimes cause panels to appear off-screen in OS X 10.4. Fixed a bug that prevented strokes being completed on mouse up on some Tablet PC devices with older drivers or specific hardware configurations. Fixed a crash that could occur when switching off ink-services in the ArtRage preferences panel for some hardware configurations. Fixed a problem that could cause a dark blob of paint at the start of each paint stroke for some users with specific tablet configurations. Fixed a bug that prevented layers above 0 being selected on G4/G5 Macs. Fixed a crash bug that would occur after holding down H or V for some time doing a quick mirror. Fixed a bug that prevented pasting data from external applications on OSX 10.6 and in some cases 10.5. Fixed a bug that prevented the default shortcuts for Select Next Layer (Ctrl Up) and Select Previous Layer (Ctrl Down) working. Fixed a bug in JPEG compression quality settings on Windows that caused JPEG files to be overcompressed on export. Fixed a bug that could transparency on base layers to be lost when exporting to PSD. Fixed a bug that prevented pressure adjustment through keyboard shortcuts (Up/Down keys) updating the brush size proxy in the tool picker. Fixed a bug that caused clicking in the titlebar of the settings panel to deselect the currently selected preset if there was one. Fixed a bug that prevented the palette knife storing Drip Spread and Falloff values in its presets. The ArtRage Window now titles itself based on the painting name. Shift + Character shortcuts now work on OSX. Added all Snap Art 2 filters to the Photoshop filter exclusion list. The shortcut keys for changing tool size and current tool pressure values have been shifted to the customisable shortcuts system. Tool Size: Left/Right arrow for -/+1% size, Shift + Left/Right arrow for -/+10% size. Tool Pressure: Up/Down arrow for +/-1% pressure, Shift + Up/Down arrow for +/-10% pressure. These keys can now be customised in the Tools section of the shortcut panel. Because the old keys have been removed you will either need to reset your shortcuts to default or add those keys in manually using the shortcuts panel from the Edit menu. ArtRage on graphics tablet issue? If you’re using ArtRage on Windows and see strange behaviour when using a graphics tablet, try the following: Check that you have the latest version of ArtRage ( Help -> Check for updates online ). 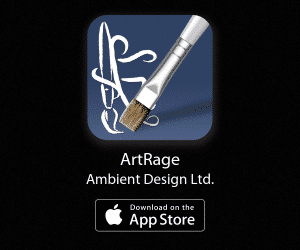 If not, download the latest version of ArtRage from our Member Area. Download and install the latest version of tablet software from your tablet manufacturer’s website. If you still have problems, please contact us via the support page so that we can help. Link to this item: ArtRage on graphics tablet issue?